A light and airy second floor flat in a convenient and sought after spot on Hammersmith Grove. It offers a generous reception and main bedroom - a separate kitchen off the living room which has stripped floorboards, a gas fireplace and a pleasant outlook.The two bedrooms are situated at the front and again have pleasant leafy outlooks. In a convenient location between Brook Green and Brackenbury Village, Hammersmith Grove is an elegant tree lined street that has its own parade of shops, cafes and restaurants. Westfield and Central line tube and Hammersmith Broadway (Main tube and bus station) are equidistant, and within a short walk. Goldhawk Road tube is also only a few minutes walk from the property. It is within the catchment area of good local nurseries and primary schools. 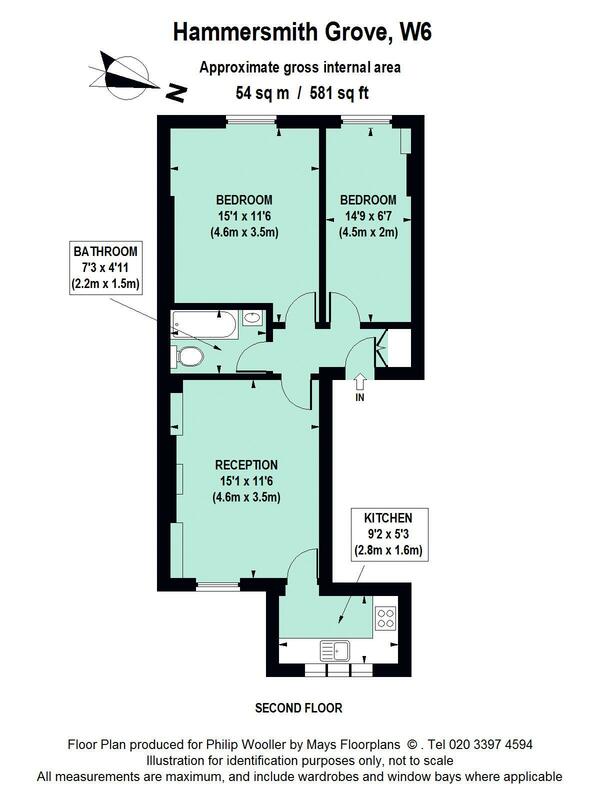 581 sq ft / 54 sq m approx.